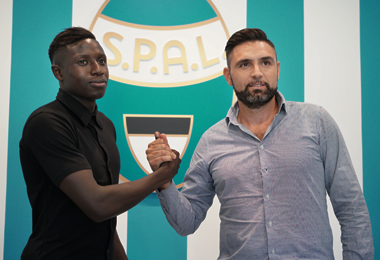 Wednesday, July 26th 2017, we closed the transfer of Pa Konate from the swedish champions Malmö FF to Italian Serie A club SPAL. The left defender flew to Italy together with Modyr Management's agent Nima Modyr for a medical test and signed the contract the same day. Pa Konate has played for Malmö FF for almost his entire career. In 2012 he moved up to the first squad and he made his debut in the swedish Allsvenskan in an away game against AIK 2013. The year after, he was on loan to Östers IF in the swedish second division Superettan until the summer window. Then he went back and played the Champions League qualifying games with Malmö FF, and then also the group stage. In total he made 57 appearances in Allsvenskan for Malmö FF and 15 games in Superettan with Östers IF. The 23 year old back have also made 14 appearances for the swedish national Under 21 and was called up for the squad to playing the U21 European Championship this summer in Poland. But in the last league game before, he got a injured and had to leave the refund. Now he´s back again and a new adventure is waiting in one of the biggest league in Europe. The contract with SPAL is on four years.